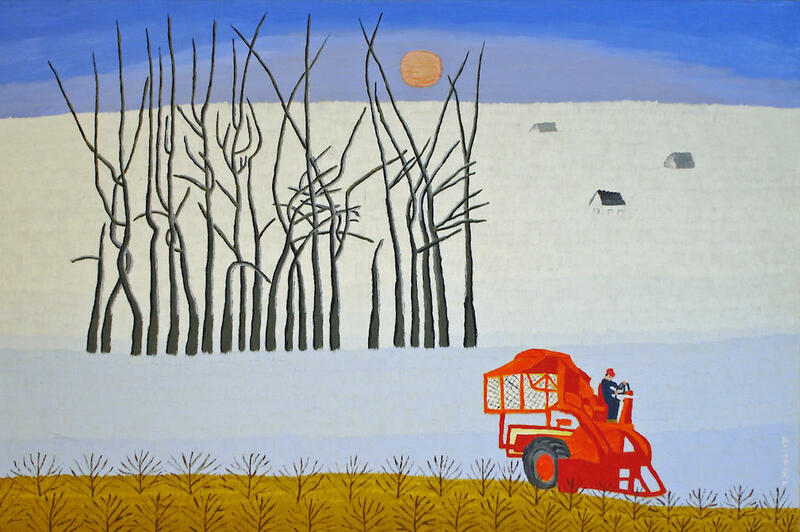 A shy, unassuming farm girl from northern Mississippi, Theora Hamblett became one of the South’s most distinguished self-taught artists. Noted for her colorful depictions of the Mississippi countryside, often showing children at play, and her idyllic memory paintings of the rural South, Hamblett is perhaps best known today for her eerie, sometimes wistful renditions of her daydreams and visions. The daughter of Samuel Fielder Hamblett and his second wife, Tamzy Sophia Cobb Hamblett, Theora grew up with one brother, Samuel Hubert Hamblett, on the family’s farm near Paris, Mississippi. The Hambletts lived in a dogtrot house her father had built before the Civil War and maintained a farm of several hundred acres with tenant families: they plowed, planted, and harvested cotton and tended cattle, sheep, hogs, and chickens. Theora walked a mile and a half to school, and her family regularly attended church, alternating between the Methodists and the Baptists. Hamblett’s memories of her early life—feeding chickens, picking cotton, sorghum making, spring cleaning, walking to school on frosty mornings—created an idyllic vision of her early life. After graduating from Lafayette County Agricultural High School in 1915, Hamblett began teaching in one- and two-teacher schools, a career she followed intermittently for nearly two decades. On occasion, she attended summer school at the University of Southern Mississippi. After her mother’s death in 1935 and several dismal years of trying to support herself by raising poultry, she moved from the family home to Oxford. In 1939 she bought a large house and divided it into four apartments, renting out three to students and reserving the fourth for herself. Not until Hamblett was fifty-five years old did she finally succumb to the allure of making art, signing up for an adult education course offered by the University of Mississippi. She soon enrolled in a correspondence course sponsored by Connecticut’s Famous Artists School. Although she learned basic painting techniques from such efforts, Hamblett determined to become her own teacher, saying she had to find her own way. In the mid-1950s Betty Parsons, a New York art dealer, purchased The Golden Gate, a painting inspired by a vision Hamblett had experienced some thirty years earlier. Parsons then sold the painting to Albert Dorne, the president of the Famous Artists School, who gave it to the Museum of Modern Art, which exhibited it under the title The Vision in 1955. Over the next twenty-two years, Hamblett developed an extraordinary oeuvre, exact in workmanship and meticulous in style. Using oil paint on canvas or Masonite, she developed a unique pointillist technique that invested her paintings with a distinctive look. Although she embraced figurative representation, Hamblett employed few of the techniques used in Western art, such as one-point perspective or modeling, to simulate nature. Instead, she developed an approach that was both conceptual and decorative, conveying her thoughts in a language that is wonderfully ornate yet extremely refined. Hamblett’s subject matter can be divided among four basic themes—(1) pure landscape paintings; (2) landscape paintings with children playing games; (3) memory paintings, often with scenes set within a landscape; and (4) dreams and visions. Almost all demonstrate her love of nature and her beloved trees. The last category is the most personal, detailing the visions that she first experienced at age seventeen and that occurred more regularly in later life. She took these visions as a sign that God wanted her to paint her dreams, and, indeed, the images inspired by her visions often have religious connotations. They also suggest an understanding of symbolism. Hamblett’s paintings, however, share little similarity with traditional religious iconography and are instead highly idiosyncratic. In addition to the Museum of Modern Art, Hamblett’s paintings hang in the permanent collections of the Morris Museum of Art and the Ogden Museum of Southern Art. Her work has been exhibited at the Corcoran Gallery of Art, the American Visionary Art Museum, the Walter Anderson Museum of Art, and the Memphis Brooks Museum of Art. In Mississippi, Hamblett’s paintings can be found in the collections of the Mississippi Museum of Art, the Lauren Rogers Museum, and the University of Mississippi Museum, which today maintains Hamblett’s archive, including some six hundred of her paintings.